John F. from the U.K. wrote in reply to the review of Antony Flew’s book There is A God. 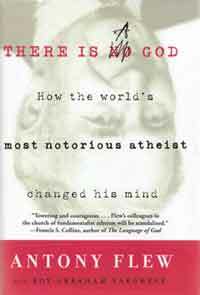 He raised some questions and quotations from atheist authors who argue that the idea of God is a case of wish-fulfillment. John’s letter is first printed in full, followed by a point-by-point response by the reviewer, Lita Cosner. Why do you refer to HIM as your heavenly father? As children we grow up knowing our father is there to look after us, protect us and solve our problems. Also, it is known that the religious feelings of our parents, who we believe would not lie to us, play a strong part in our development. When we grow up we are faced with the horror of making our way through life ON OUR OWN. We come face to face with reality, of the need for “success” and the fear of failure and death. “We have a strong unbearable feeling of helplessness, so that our thoughts become related to a power outside ourselves, there is nothing we do, think or feel which is not known to this power. We expect protection by Him, wish to be taken care of by Him, make Him responsible … ..” (Erich Fromm “Escape to freedom”). If the Bible got earthly events right, it can be assumed to be trustworthy when talking about heavenly things too. For many reasons. First, because the Bible, which has proved to be an excellent historical source, even when subjected to more scrutiny than any other document in history, claims to be God’s revelation of Himself and His actions in the world. I believe that the Bible is a reliable theological source based on its historical accuracy; if the Bible got earthly events right, it can be assumed to be trustworthy when talking about heavenly things too (John 3:12). Furthermore, certain events are unexplainable unless the biblical events actually happened. For instance, it is very unlikely that a Galilean peasant with a band of fishermen would go on to be the most famous and influential person in history, and that days after his execution for being a political insurgent (claiming to be King of the Jews), his disciples would go from cowering in a crowded room afraid for their own lives to boldly proclaiming that the man had risen from the dead in a bodily resurrection; an idea completely contrary to Jewish thought. The only thing that makes this plausible is if Jesus actually was the Son of God incarnate, who actually was resurrected. Second, I believe that the best explanation for the combination of complexity and imperfection that we see in creation is that creation was once perfect and has since fallen from that state, since it is much easier to break something than it is to create it. Naturalistic evolution lacks the mechanism to create the fascinating structures we see in nature, many of which inspire human engineers to improve their own designs. If nature has better structures than humans can design, I think the best explanation is that creation had a better Designer, and we still see this, despite the fallen state of creation. Third, I am not persuaded that sentience and ethicality could arise from dead matter as simply the result of chemical reactions which happen in the brain. There is evidence that humans are more than just physical beings; that we have a non-physical part of us too, which could be termed the mind or the soul. The brain is a vehicle for the mind, but it is not the same as the mind, since things can be said of the mind which are not true of the brain. For instance, if I think about something while I am hooked to a brain scanner, a neurologist could see the areas of my brain that light up, and might be able to tell if I’m using visual or language areas of the brain, but he could not know from the brain scan what I’m thinking of unless I tell him. For more, see The conscious mind: evolutionary difficulties. I also note that you didn’t address any of the reasons that the famous atheistic philosopher Antony Flew gave, as noted in my review that you’re replying to. Christians call God our Heavenly Father because He is our Heavenly Father. The short answer is: we call Him our Heavenly Father because He is our Heavenly Father. Because Jesus Christ died a sacrificial death which is effective for all who believe in Him for salvation and forgiveness of sins, we can be reconciled to God, and adopted into His family, an inconceivable gift, and one of the most dramatic proofs of God’s love for us (1 John 3:1). Both the Holy Spirit and our spirit testify to the fact that we are children of God (Romans 8:16); we are even called co-heirs with Christ (8:17). This relationship comes with responsibilities as well as benefits, however; because of our status as children of God, we are commanded to live according to God’s code of ethics (Philippians 2:15). Entrance into God’s family is not something that anyone can be good enough to earn; there is no way to reconcile ourselves to God, because we are all born as “children of Satan,” in that, like Satan, we rebel against God, and we sin. Without the Holy Spirit’s work, we could not even see membership in God’s family as desirable, much less attain it. Furthermore, every person who has ever lived has belonged to one of the two “families”; the Bible presents a clear dichotomy; either you are with God, or you are with Satan (for example, 1 John 3:10). If you are objecting to the male pronoun, see my article What’s in a pronoun? The divine gender controversy. Nice psychoanalysis, but you should know that this old Freudian stuff has been discounted long ago. In any case, this does not explain all situations. Someone who was abused by his father, for instance, might find the idea of God as Father to be a stumbling block, not a comfort. Someone who is forced to become independent at an early age might pride herself on being independent and be reluctant to admit that she is dependent on God. You have to admit that, if nothing else, Christians are not as one-dimensional as you’ve portrayed them to be. Or perhaps the feeling of ‘helplessness’ as you put it is because we are helpless with the vast majority of circumstances. We do not get to choose which family we’re born into, how other peoples’ reactions affect us, and so on. The feeling of control over our own fate is the actual illusion. And the knowledge that there is a God that is above all of that, who is actually in control, is a comfort, though atheists like yourself mock that. Talking to religious people: “ … after we tell you something, and you just can’t believe it. Well, I have to decide who to believe. The Bible has a great record when it comes to historical reliability, it has a claim to be the very Word of God, which its reliability in other areas backs up, and following its teachings has proven to change people’s lives across millennia and various cultures. What do you have to offer to rival that? You can’t accept it. You don’t like it. I think very few people like all the Bible’s commands all the time; it’s part of our sinful nature to want to rebel, especially when we first convert, and sin can be “fun” in a momentary, shallow way. There are parts of the Bible that challenge every Christian; the specific challenges can differ based on the culture a Christian lives in, that Christian’s personality, and what sins they’ve participated in during the past. You seem to also be working from a fake wish-fulfillment view of Christianity where God is the cosmic Grandpa who gives out goodies and is endlessly only loving, which is not the case. Christianity is not the easy path to success that some televangelists claim it is, especially when the Bible’s commands run counter to everything the world tells us we should seek and love, although we in Western nations hardly have anything to complain about compared to our brothers and sisters who are being persecuted and killed around the world for the Gospel; more have been martyred in the last century than the previous 19 centuries combined. But we choose to accept the Bible’s teachings because it claims to be inspired by a God who created us, and thus knows what’s best for us more than anyone else. The Bible promises eternal things in return for the transitory and shallow sins we’re commanded to give up; God gives much better things than the world can offer. And He has proved His love for us by sending His Son to die a horrific death for our salvation. Again, what do you have to offer to rival that? … you must show that a man is wrong before you start explaining why he is wrong. The modern method is to assume without discussion that he is wrong and then distract his attention from this (the only real issue) by busily explaining how he became to be so silly. In the course of the last fifteen years I have found this vice so common that I have had to invent a name for it. I call it “Bulverism.” Some day I am going the write the biography of its imaginary inventor, Ezekiel Bulver, whose destiny was determined at the age of five when he heard his mother say to his father—who had been maintaining that two sides of a triangle were together greater than the third—“Oh, you say that because you are a man.” “At that moment,” E. Bulver assures us, “there flashed across my opening mind the great truth that refutation is no necessary part of argument. Assume your opponent is wrong, and then explain his error, and the world will be at your feet. Attempt to prove that he is wrong or (worse still) try to find out whether he is wrong or right, and the national dynamism of our age will thrust you to the wall.” That is how Bulver became one of the makers of the Twentieth Century. I find the fruits of his discovery almost everywhere. Thus I see my religion dismissed on the grounds that “the comfortable parson had every reason for assuring the nineteenth century worker that poverty would be rewarded in another world.” Well, no doubt he had. On the assumption that Christianity is an error, I can see clearly enough that some people would still have a motive for inculcating it. I see it so easily that I can, of course, play the game the other way round, by saying that “the modern man has every reason for trying to convince himself that there are no eternal sanctions behind the morality he is rejecting.” For Bulverism is a truly democratic game in the sense that all can play it all day long, and that it give no unfair advantage to the small and offensive minority who reason. But of course it gets us not one inch nearer to deciding whether, as a matter of fact, the Christian religion is true or false. That question remains to be discussed on quite different grounds—a matter of philosophical and historical argument. However it were decided, the improper motives of some people, both for believing it and for disbelieving it, would remain just as they are. I see Bulverism at work in every political argument. The capitalists must be bad economists because we know why they want capitalism, and equally Communists must be bad economists because we know why they want Communism. Thus, the Bulverists on both sides. In reality, of course, either the doctrines of the capitalists are false, or the doctrines of the Communists, or both; but you can only find out the rights and wrongs by reasoning—never by being rude about your opponent’s psychology. Until Bulverism is crushed, reason can play no effective part in human affairs. Each side snatches it early as a weapon against the other; but between the two reason itself is discredited. And why should reason not be discredited? It would be easy, in answer, to point to the present state of the world, but the real answer is even more immediate. The forces discrediting reason, themselves depend of reasoning. You must reason even to Bulverize. You are trying to prove that all proofs are invalid. If you fail, you fail. If you succeed, then you fail even more—for the proof that all proofs are invalid must be invalid itself. It is ironic that you criticize us for unthinking belief in God, but your argument is mostly unthinking parroting of atheists whose books would not stand up to even a small fraction of the scrutiny the Bible has withstood.